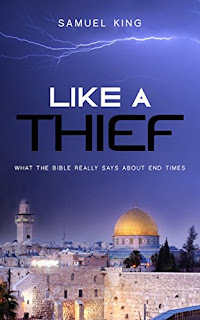 “Like a Thief - What the Bible Really Says About End Times”, is an orderly timeline of the twelve major events of the Last Days. The first half of the book concerns Jesus' first coming. The second half addresses the earth-shaking major End Time events. It connects the Old Testament prophets and prophecies, Jesus' teachings in Matthew 24, and Paul's writings along with sparkling gems found in the Book of Revelation. See in advance the spiritual warfare involved in the upcoming Battle of the Ages. Get on the winning side. Be educated and prepared for what is ahead - a must-read guide for the historic times in which we live! Newly Revised and Updated for 2018 for your reading enjoyment!